Mash eggs & mix with salad cream or mayonnaise. If you prefer a sweeter taste, go with salad cream. I like mine with mayo. Clean & devein prawns; separate the heads. Blanch prawns & heads. Drain & transfer to ice water to prevent them from over-cooking. Dice prawns & set aside. Remove apple & mango skin & dice fruits into small cubes. Soak apple in salt water, lemon juice or cider vinegar to prevent it from browning. I usually use the traditional method of soaking in salt water handed down by my mom. Add them into egg mixture, together with the diced prawns. Remove excess “sauce” from beancurd skin & stuff mixture into the pockets. You may have to cut & adjust the pocket height. Cut up watermelon & start plating your dish. 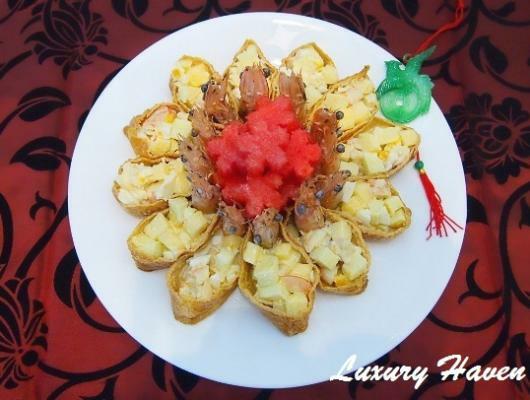 Chill your appetizer & you’re ready impress your guests with this Inari Age Laughing Prawns Salad (嘻哈大笑虾沙拉)! Why the name “Laughing Prawns”? In Cantonese, the word for prawn is Ha (虾); or in Mandarin, it sounds like 哈, which means laughter. So let’s all go "Hahaha!" with this refreshing sweet & sour appetizer!